Lanvin will launch Jeanne Lanvin Scandal, a new perfume for women, this month. Jeanne Lanvin Scandal is an updated version of 1933's Lanvin Scandal. The fruity floral fragrance was developed by perfumer Anne Flipo. The notes feature apricot, pear, orange, freesia, rose, peony, musk and sandalwood. 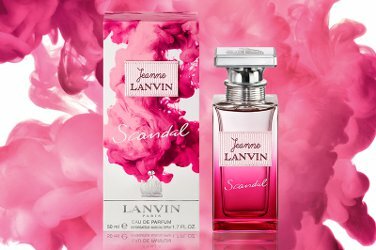 Jeanne Lanvin Scandal will be available in 50 and 100 ml Eau de Parfum. That sounds… so not scandalous. Also, who knew scandal would be represented by PINK? All those notes are purely modern. It takes some kind of nerve to assert that it’s an update of a 1933 scent, and I’d wager you cash money it’s not updated ANYTHING, not a single point of contact with the original: it’s just another fruity floral. I will try this if I see it, only because Anne Flipo has produced some of my favourite perfumes. Hopefully it’s not too sweet! I like Anne Flipo too. Doubt I will see this, I never see anything from Lanvin here. This is *not* an updated version. Scandal was a glorious leather fragrance. Why wouldn’t they recreate that instead? I always dreamed it would come back and now Lanvin has killed that dream. Shameless! This makes me so sad but even above Dior, Lanvin ravages its back catalogue. We all knew this after Rumeur.